The title of this post leaves very little to your imagination..so let me not delay things any further, as this post is already too long and coming after a very long break. Last Sunday was Vat Poornima aka Vat Savitri Puja. And So-Saree being a sucker for following traditions and rituals, couldn't resist the temptation to write about this one. For those who dont know..Vat Savitri is the Maharashtrian equivalent of Karwa Chauth. Since the scope of this Vrat/Puja was too long to be compiled in a single post, I have decided to split it in parts. The First Part is my fav part..Story time folks...! Again, the story is what my Aai told me..n mum's always right..! So if u have any doubts please feel free to check with Wiki. The Vat Savitri Puja is done in memory of an incident which is a sub plot in Mahabharta. Savitri was the only daughter of King Asvapati. The King had given his beautiful daughter, the permission to choose her husband, and she chose Satyawan whom she met in a forest. Satyawan was the son of a blind King Dyumatsena who had lost his kingdon and lived in exile in the forest. King Asvapati, tried to change her mind, but Savitri was adamant and chose to stick to her choice. Finally her Father relented and got them married. After marrying Satyawan, Savitri embraced the life of a hermit and began living in a forest facing a lot of hardships. But she was a devoted wife and daughter in law, and left no stone unturned in fulfilling her responsibilities and duties. A year passed by, and the day Satyawan was predicted to die was soon approaching..
3 days prior to the day, Savitri started a fast ..a very strict n disciplined one. The morning Satyawan was destined to die, Savitri accompanied her husband to the forest. Satyawan while cutting wood from a Banyan tree (Vat Vriksha) fell down and fainted..! Savitri placed her husband's head on her lap, and saw Yama- the God of Death who had come to claim the soul of Satyawan. She saw him carrying the soul of Satyavan and started following him. Yama first ignored Savitri thinking that she will soon return back to her husband’s body. But she persisted and kept on following him. Yama tried to persuade her saying it is against the nature of law to return the dead to life, but Savitri remained adamant and kept following Yama, saying she would go anywhere her Husband goes. Finally, Yama told her that he will grant her 3 boons barring of course, the life of her husband, if she stopped following him..
First Boon: Her in-laws be granted their eye sight, and be reinstated in their kingdom with full glory. 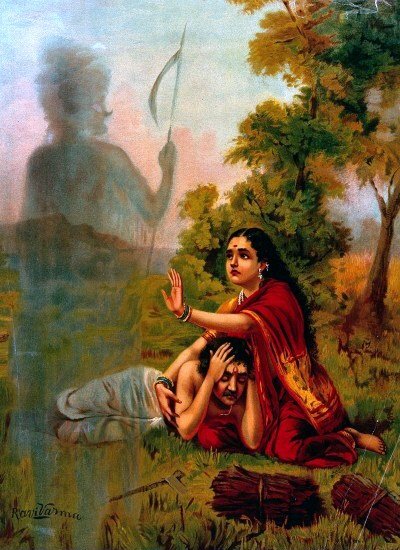 Soon Yama realized that he had been tricked by Savitri, but seeing her persistence, he gave her back her husband's soul and asked her to return to her husband's body. When she reached the banayan tree, her husband was lying dead. She started going round (pradakshina) the Vat Vriksha and when she completed the pradakshina, Satyavan woke up as if from sleep. This is the story of Satyawan and Savitri. Women worship the Vat Vriksha and perform Savitri Puja in memory of this event praying for the long lives of their husbands. That's it for today guys..hope you enjoyed reading this story. Wow this was a nice story (I knew some other version, but this one is good too.) and yes much better than Romeo n Juliet. Thanks Sweetie..u r the best. I ave read this one! i enjoyed the story..i like reading and listening to these old mythological tales..but i honestly don't get the idea of fasting to earn goodwill from god for anything. Interesting to go through the history again. U presented it well, I would need to keep this post in favorites for referring it back again. Agree with debi's comment though. But i am still confused of what goodwill fasting could bring to us.but I prefer to go with my ancestral feed. I agree wid u too Kalyani. Btw, @Surbhi & @Debi, the vrat is not to be taken literally... Fasting literally wont bring any good. But 'controlling the mind', not to think of food, for an entire day, even when feeling hungry is the concept behind why our ancestors came up with this ritual!